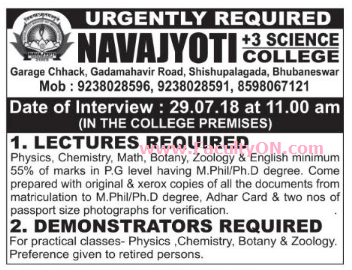 Navajyoti +3 Science College, Bhubaneswar has advertised in the SAMBAD newspaper for recruitment of Lecturers / Demonstrators jobs vacancies. Interested and eligible job aspirants are requested to walk-in on 29th July 2018. Check out further more details below. About College: “NAVAJYOTI”, now already a name in the educational hub of Odisha especially in Bhubaneswar the capital city was shrouded in mystery till 2002. In a grand historic moment it came into being in 2003 as a premier +2 Science coaching.